Marriott Grand Wailea // We stayed here for the majority of our trip, and I loved it. I had my heart set on this hotel because I'd heard so many amazing things about it, so we booked it. I then realized it was pretty far south of all the things we wanted to do, so I was a little skeptical, but it's honestly not that far of a drive and the hotel is so amazing that I would stay there again in a heartbeat! It is the most beautiful hotel ever: right on the ocean, palm trees and flowers everywhere, a gorgeous running trail... I could go on and on. I like it because it doesn't really have a "hotel" feel - the lobby is nonexistent (just a concierge desk outside) and there is no building, just a bunch of halls with rooms. The entire place is beyond gorgeous, and has so many amenities: a nice game room, tons of pools, several restaurants - you get the picture. Sheraton Kaanapali // We also stayed here for a little bit so we could explore the northern part of the island. The Sheraton definitely has a busier feel, as opposed to the laidback mood in the Marriott, but I enjoyed it all the same. It's located off Black Rock Beach, and is just north of Lahaina. It is also gorgeous, and has a nice pool and running trail too. I also thought the Paia Inn looked really cute, but we didn't stay there. If I came back to Maui, I would probably spend one night there so I could experience a different part of the island. Sunrise at Haleakala // Waking up at 2AM to drive to the Haleakala Crater wasn't exactly fun, but watching the sunrise there was the coolest thing I've ever seen. You can sit outside and watch the sun rise above the clouds, which are literally beneath you, and it is GORGEOUS. A couple things to make note of: you have to purchase tickets beforehand to insure your spot. You will have to get up at 2AM to drive there if you want to get a good seat. It is around 40 degrees up there (in July!) so wear warm clothes. Bring your camera, because it is insanely beautiful. The Iao Valley // Never in my life have I seen so much green before... it was unreal. The Iao Valley is located in the middle of the island, and after driving on a long, winding road for about 15 minutes, you reach a spot where you can hike up some stairs and see the lush green trees everywhere. Jungle Ziplines // After researching a lot of different zipline companies, we chose this one because we thought it would be interesting to zipline through the jungle. 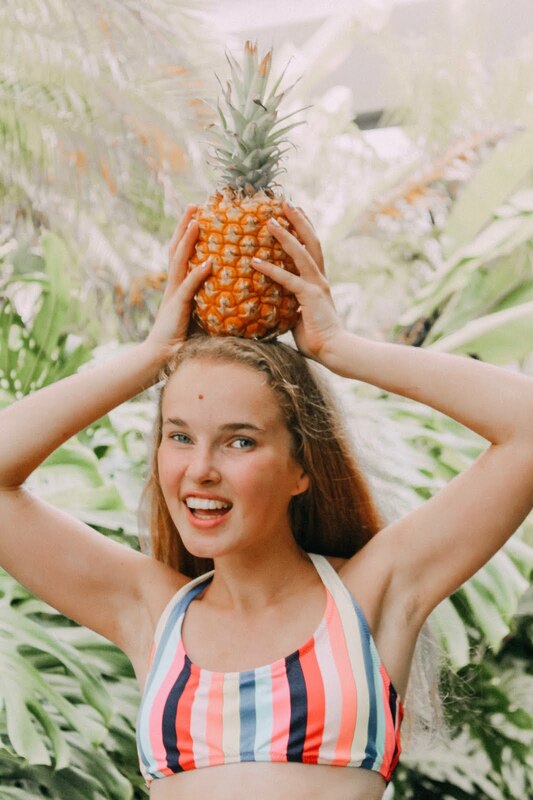 Located off the Road to Hana, Jungle Ziplines is hidden out in the wilderness, surrounded by millions of tropical plants (oh, and there are chickens roaming around, too!). Our zipline guides were the best: they were super friendly and showed us a bunch of native plants. We did seven different ziplines over the course of two hours, and it could not have been a better experience. Twin Falls // This double waterfall is the first stop on the Road To Hana. We didn't do the Road To Hana, but this waterfall is right by Jungle Ziplines, so we decided to visit it since my sister and I had never been to a waterfall. I don't think you can actually swim in it (at least, you couldn't the day we went) but it was fun to walk around and see the waterfalls. Snorkel // I'll talk about my favorite snorkeling spots in a second, but definitely carve some room in your schedule to go snorkeling at least three times during your trip! You can rent snorkel gear from many places, but we just bought some at Costco after arriving in Maui. That way, we didn't have to worry about turning it in each day. Maui has the most amazing coral reefs full of colorful fish - it's one of the coolest things I've ever seen. We didn't go to a luau or do the Road to Hana, but if we were there for longer we totally would've! Being in Maui for a week, we visited several different beaches. Ahihi-Kinau Natural Area Reserve // My dad found this place while researching good places to snorkel. I had some issues with it, but overall it's a good place to see colorful fish and coral reefs. There's no sand on the shore, just rocks, so it's hard to get in the water because you keep getting pebbles in your flippers. Then, there's a swarm of a few hundred fish right underneath you when you first get in, which freaked me out a ton. Once I got past that, though, it was really cool - coral reefs everywhere you look, with colorful fish swimming beneath you. Black Rock Beach // When I first started researching beaches in Hawaii, I knew I wanted to jump off a cliff somewhere (my grandparents are probably reading this and freaking out right now - sorry!!). We decided on Black Rock since it was right next to our hotel, and deemed the safest cliff to jump off. There are a few different spots you can jump off, but it's around a 30 foot jump from wherever you jump. It's definitely scary when you're up there and looking down at the water, (when I got up there I started laughing uncontrollably) but you just have to not think about it and just jump. The snorkeling is also really good at Black Rock. Wailea Beach // This was the beach we went to the most, since it was right off our hotel in Wailea. The waves are good for body surfing and boogie boarding, and we actually saw GIANT sea turtles swimming right by us. I'm talking a good three feet long. One even ran into my dad! It was without a doubt one of the coolest things I've ever seen. Oluwalu Beach // A turtle cleaning station is located right off Mile 14 on the Honoapiilani Highway. We weren't sure what a turtle cleaning station was, but a quick Google search told us that it's an area where small fish clean the turtle's shells. We didn't snorkel here because we ran out of time, but it sounded so cool that I had to include it. Keawakapu Beach // This beach in Kihei was my personal favorite spot for snorkeling. We saw a lot of cool fish here, as well as a sea turtle! There's also a lot of gorgeous coral. Honolua Bay // This was the first place where we snorkeled, and it was fun, but probably my least favorite. It was cloudy and drizzling when we went, so the water was kind of murky and we didn't see much. However, it's supposed to be beautiful and clear on sunny days. Neither my dad nor my sister likes shopping, so I didn't really do that much shopping. However, I did visit a couple places that I wanted to share with y'all! Paia // The main street in Paia, a small little hippie town, is lined with so many boutiques and gift shops. Before we ate at Mama's Fish House, we walked along the street and bought a couple souvenirs to take back home. Front Street, Lahaina // Front Street is the main street in Lahaina and has tons of cute t-shirt shops, boutiques, and plenty restaurants! It's right on the water, too. A large outlet mall is located right nearby, too. We did some shopping in the Adidas store there. Kihei Marketplace // At the heart of Kihei, there's a small marketplace with dozens of little popup shops. 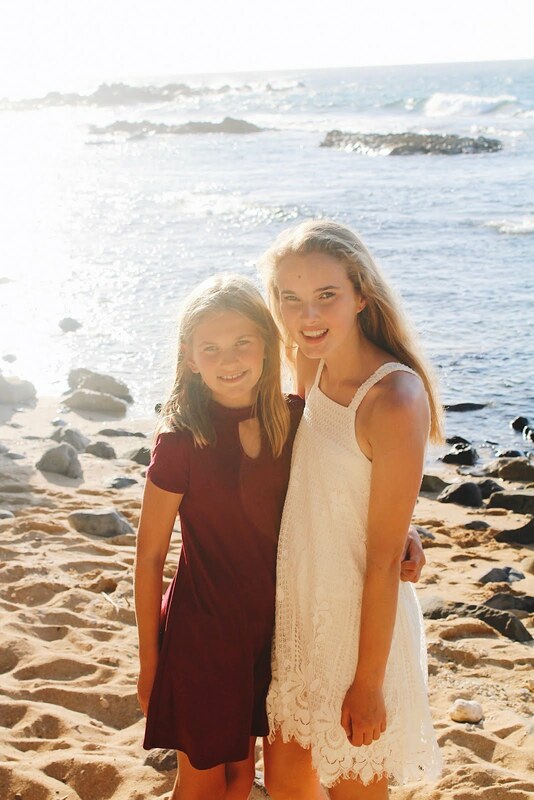 From Maui t-shirts, to handmade jewelry, there's something for everyone. Mahena // Mahena is a trendy clothing boutique located all over the island - I stumbled across four different locations by accident! They have tons of cute clothes at a great price. Malibu Shirts // If you're looking for a good place to buy Maui t-shirts, head to the Shops at Wailea to visit this vintage t-shirt shop. All of their t-shirts have a vintage feel, and they come in the cutest designs. They are a little expensive, but they're very well made and I'm excited to wear mine! Monkeypod Kitchen // I would describe this restaurant as an American restaurant with a bit of a Hawaiian twist. Their pizza and fries are very good, but they also have some amazing fish dishes. We knew it was going to be a good restaurant when it was packed at 8PM on a Wednesday night (make reservations if you go!) I had fresh fish (of course) but their pizza is also incredible. We went here once for dinner, and once for appetizers. South Maui Fish Co // The #1 restaurant on Maui is a food truck. And it's sooooo good. Good enough to the point that we went there twice. Every day, they have a fish of the day that comes in various forms, and the truck stays open until it sells out. The first day, they had Hebi, which was incredbile. The second day they had Marlin, which is a little more "fishy" tasting but also quite good. However, my favorite thing was their Ahi fish tacos. I don't like tuna, so I didn't realize the tacos are always made with tuna instead of the fish of the day, but they are SO good. The tacos have the most amazing sauce, and the fish is so tender and flaky. If you want to try the fish of the day, you can't go wrong with a fish plate. Three's Bar and Grill // Another place we liked enough to go twice! Three's started out as a food truck, and they expanded to a restaurant in Kihei. Their customer service and atmosphere are both spectacular, but their food is really what steals the show. Their menu is a fusion of southwestern, Pacific, and Asian food, and boy was it good. We got the special both nights (mahi mahi with a glazed curry sauce over a bed of rice and green beans) and it was heaven. Their hurricane fries (tossed with spices and aioli) are also delish. Don't forget to try their Lilikoi cheesecake for dessert! Hula Grill // We spontaneously decided to go to this place since it was within walking distance from our hotel in Kaanapali. It's actually owned by the same people who own Monkeypod, so we knew it would be good! They have a large patio with a lively feel to it - casual, but fun and upbeat. I believe I got their macadamia nut crusted mahi mahi (about the 5th time I'd had that meal in the past week, but I'm not complaining) and my dad got the ceviche. For dessert, we split the pineapple upside down cake three ways. Longhi's // Located at the Shops at Wailea, Longhi's is a classic restaurant with a gorgeous atmosphere and even better food. My dad and I split a plate of Moonfish with a mushroom sauce and some gnocchi. Paia Fish Market // This was another place that we visited multiple times - you like what you like, I guess! They have different locations all over the island, so we went twice for lunch. It's your typical Hawaiian lunch place - fish tacos, fresh catch of the day, etc, but it's so good. I got their fresh fish plate both days. You can get it prepared a few different ways - I got mine Cajun style. The fish comes with a side of home fries, and they're the best fries I've ever had. Ululani's // Upon taking the first bite of our giant snow cones, all three of us agreed that it was the best shaved ice we'd ever tasted. 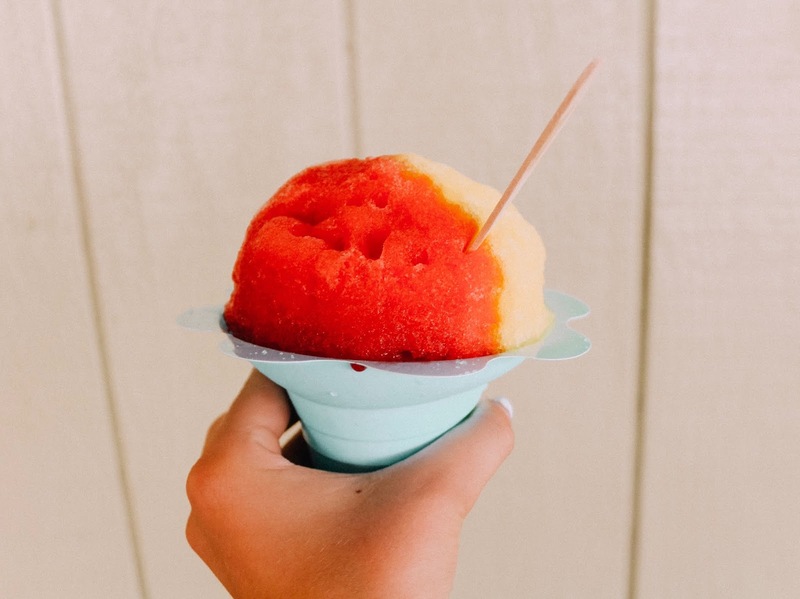 Ululani's shaved ice stands are located all over the island, and they have around 30 different flavors of syrup. I'd recommend getting the coconut - it was so sweet and creamy! Ono Gelato // We had a lot of dessert on the trip, but I'd have to say this gelato was my favorite. Like Ululani's, there's several different locations, but I think the one on Front Street in Lahaina is the main one. They have a rotating menu full of rich, decadent flavors. I got the sandy beach - peanut butter with graham crackers. It's perfect to snack on while walking around Front Street! Wow Wow Lemonade // I'd seen this trendy cafe all over Instagram, so of course I wanted to go. 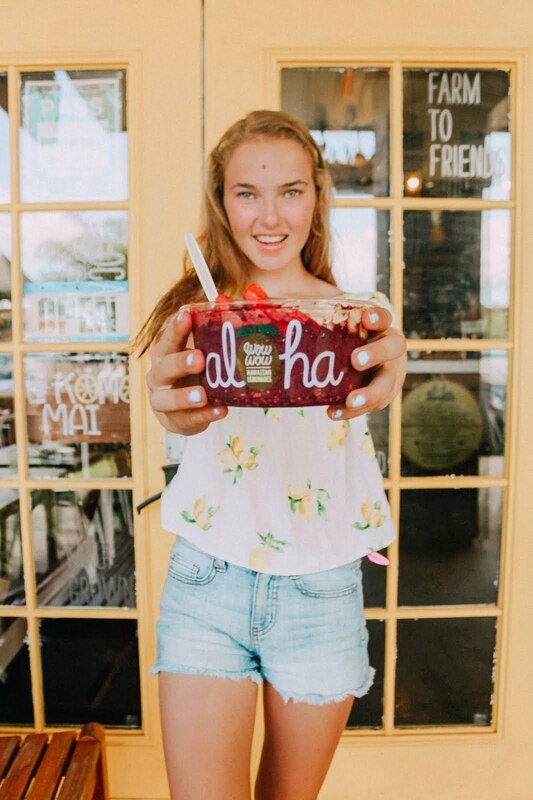 I didn't get their lemonade because it's pretty expensive, but I did try an acai bowl there and it was the best one I'd ever had. My dad got their avocado toast and loved it - he keeps trying to recreate it at home, but he can't quite get it as good as theirs. Oluwalu Juice Stand // Located right off Honoapiilani Highway, you can't miss this juice truck while driving through Oluwalu. I'll be honest: their juice is not that great, so I wouldn't recommend getting some, but they have a big farmer's market where you can buy fresh pineapples. We got one and enjoyed it on our hotel balcony a couple days later. Lappert's Ice Cream // I like this ice cream store because they have a lot of unique flavors. I don't remember exactly what mine was, but I believe it had salted caramel, coconut, and macadamia nuts all packed together into one little scoop. They also have really good coffee (or so I've heard) but I didn't try any. 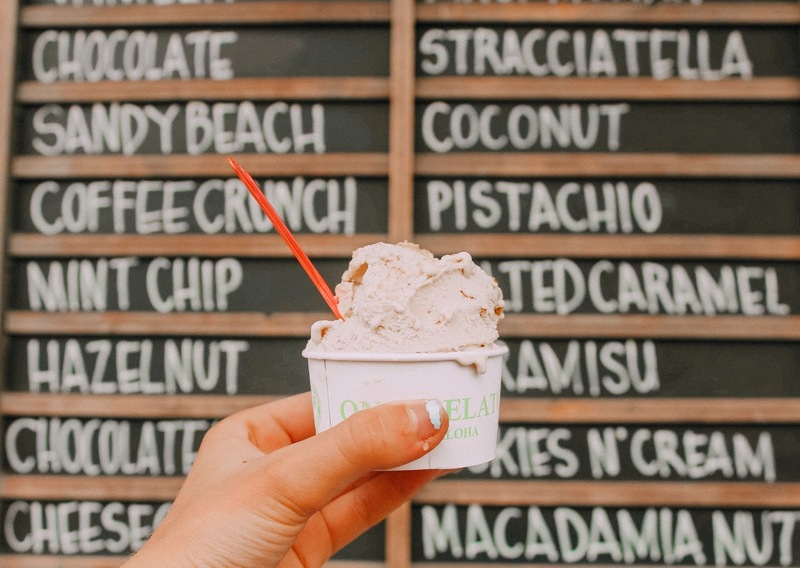 Island Cream Co // While reading Buzzfeed articles one night in the hotel room, I discovered a list of the best ice cream places in each state. Naturally, I checked to see what Hawaii's best ice cream place was, and when I saw it was in Maui I knew we had to go! 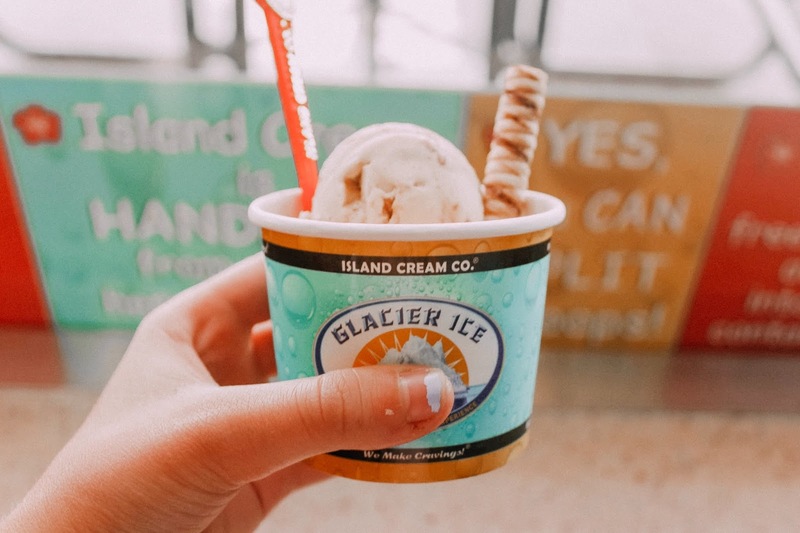 They have tons of different flavors to choose from, and I like that you can split your scoop in half if you want to try two different flavors. I got peanut butter and salted caramel, and they were both amazing. Honolua Store // If you're looking for a quick breakfast stop while exploring the northern part of the island, head to the Honolua Store for a large selection of coffee, breakfast pastries, and freshly made meals. I had a macadamia nut coffee and a meal of the sweet bread french toast. Kula Lodge // After seeing the sunrise at Haleakala, we went here for breakfast per the recommendation of a lady we'd talked to at our hotel. I got the macadamia nut crusted pancakes, and then something magical happened: I was introduced to coconut syrup, aka the sweetest, best thing I've ever tasted. Think maple syrup, but thicker and coconut flavored. I could literally drink the entire bottle. It's that good. Mama's Fish House // Have you ever had a meal that you didn't want to finish because it was so good and you would be sad when you ate it all? That was basically me with Mama's. Every travel guide you read will tell you to go to Mama's Fish House. 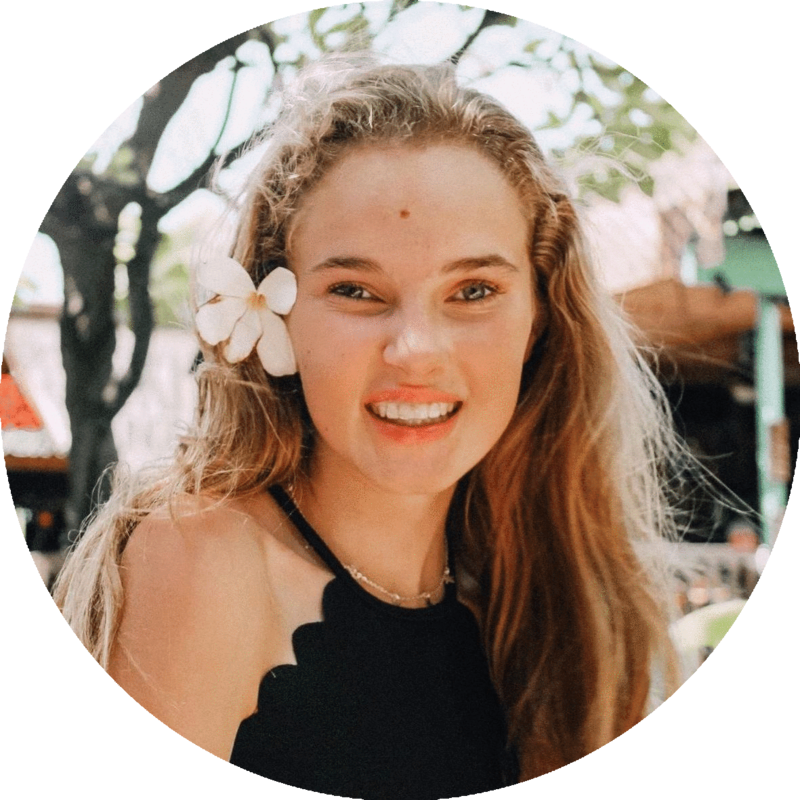 Located right off the beach in Paia, Mama's is a gorgeous restaurant that not only has a beautiful atmosphere but also the best food you'll ever eat. It is definitely pricey, but it's also definitely the best meal I've ever eaten. Their menu changes daily, but I think they have similar dishes all the time. I got the macadamia nut crusted Mahi Mahi stuffed with shrimp and lobster. I don't even need to tell you how good it was. Make sure you make your reservations at least a month in advance - this place fills up quickly! 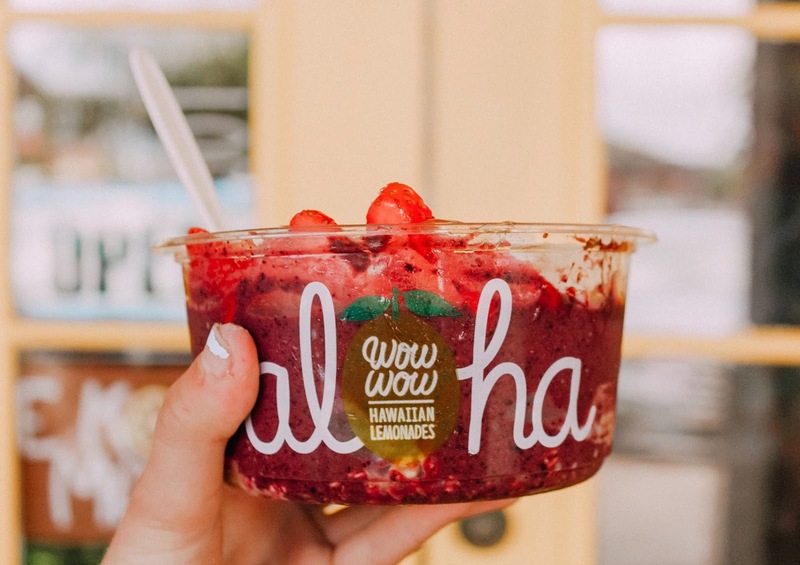 A couple places we wanted to try but didn't: Fleetwood's, Aloha Mixed Plate, The Gazebo, Leoda's Pie Shop, Humuhumunukunukuapua'a (took me a week to learn how to pronounce that! ), & Lahaina Fish Co. In all my three years of blogging, this is probably the longest post I've ever written. I hope you enjoyed, though! If you've ever been to Hawaii, I'd love to hear what your favorite things you did were! If you are planning on going, I hope you found this post helpful!